Background: I am a part-time gamer and full-time PC tech. Having a house to keep running I cannot always indulge myself with the latest upgrades. As a result I have been running a…...Dell XPS Gen5 with the Pentium-D chip and Geforce 9600 card. This year my wife suggested I build a new computer for “us” as a shared Christmas gift. After much debating I agreed and came right here to reeducate myself in the finer points of PC building. Build Info: My main goal was to get something modern, but within a budget that would give me a good foundation for later expansion. While my initial idea was between an ATX and Mini-ATX I ended up settling on the smaller Micro-ITX as it would allow more portability between my computer station and the TV. Overall my current needs are low. The highest resolution screen in the house is the TV at 1080p, and many of my games are older, from various bundle sites and served via Steam. Note: I do realize some of my selections may be a bit unbalanced. At the time of purchase my goal was future growth. Still I could have saved a bit of money here are there as you will notice. Also, not listed are a 180gb SSD and 2tb Western Digital Black drive. These were purchased via our company outlet so I did not include them. OS will be Windows 10 Pro x64. I will be using a free upgrade attached to a already owned Windows 7 License. 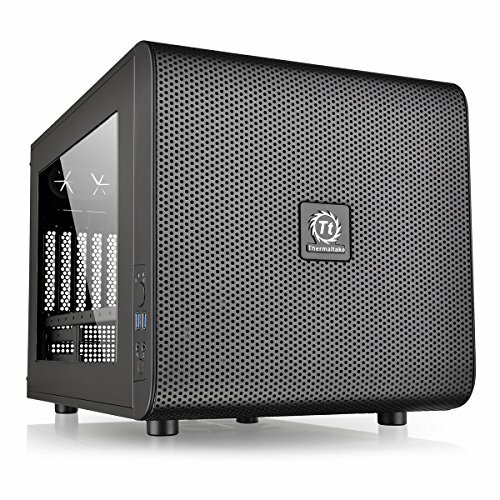 Thermaltake Core V21 MicroATX Mini Tower Case : When I first came here for build ideas I saw this included in a build and found myself drawn to the square form-factor and customization. This choice is what put me on the smaller build path. As noted in other reviews the PSU bracket is difficult to work with. I found my best approch was to assemble the 2 parts of the bracket in the L shape, mount the PSU, and then partly screw in the bracket. Then I had to “fish” a bit to lock in the free side into the hole, located at the very bottom of the drive cage. Almost no noise from the fan. 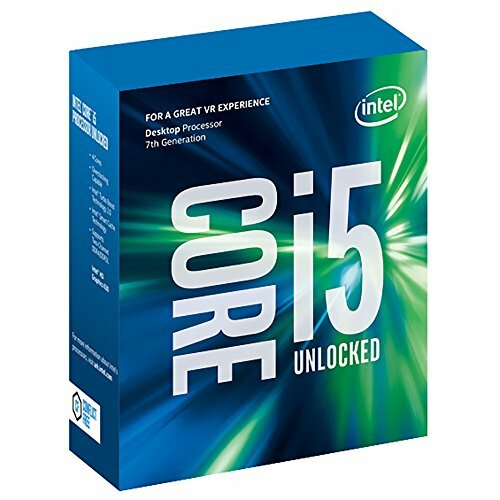 Intel Core i3-6100 3.7GHz Dual-Core Processor: I wanted to save money while still allowing for improved gaming without bottlenecking my card choice. The i3 seems to be perfect for my current needs and going with Skylake would give me future upgrade plans. MSI Z170I GAMING PRO AC Mini ITX LGA1151 Motherboard: While looking for a board that would handle faster memory and my i3, along with giving me future growth to an i5 or i7 I stumbled on this gem. I could have gone with a less expensive item but I think the bit of investment will pay off, especially with the reports of overclocking coming to the non-k chips. If any single part is off on my build I would guess it is here. That being said it is a solid board so time will tell if the more cost effective options would be best. On my completed build I updated the BIOS and noticed that it let me change the Base Clock. For testing I have it at 101.1. Corsair Vengeance LPX 8GB (2 x 4GB) DDR4-2666 Memory: I originally wanted 16gb but to save some money I went for 8. Based on a review about the i3 and fast memory I went with DDR4 2666 memory to see if I could squeeze out some performance. It will also allow me to upgrade the chip first without needing to touch the memory in the future. The look also drew me in. Gigabyte GeForce GTX 960 4GB Video Card: I am a NVIDIA fanboy. My past builds have almost always had their cards. The few times I did not use them did not work out well so I tend to stick with them, even after all this time. This card was at a good point for both price, performance, and memory. My current desk setup has 2 DVI monitors and this car fit the bill as far as outputs while also having a HDMI and Displayport should I ever need them in the future. EVGA SuperNOVA GS 550W 80+ Gold Certified Fully-Modular ATX Power Supply: I found this power supply on some of the builds using the Thermaltake case and felt it would be perfect for my needs. Being modular should help me be a bit cleaner on my cabling. Most of my worry about the build is here as I am not sure how this PSU will fair as I upgrade components in the future but that is down the road. The install was a bit of a pain only because I had to pull the PSU. The radiator is mounted on the right side (if looking at the case from the front) and close to the front so I can take advantage of the air filter. This means I moved my window to the left, where it belongs. Go slow with this install. Make sure the plastic is flat on the bracket for best results. The tubing is a bit stiff but mounting it this far allowed a bit of leverage to get everything right. The pump is on the new 12 volt plug and the intake fan is on the CPU header. This is not the recommended setup but I wanted to keep fan control on the system board, and in turn in the MSI command center. CPU is running -20c cooler at idle and never gets above 60c. The noise is a bit louder than the default cooler but the fan is closer to me than it was before so I expected this. OS: Windows 10 Professional x64 (1511 release), UEFI boot on the SSD. Nothing special here as this is technically a “Shared” PC and my wife will need access via her account as well. Updates 1/18/2016 - It is the new year now and after some tweaking I finally got the Non-K Overclocking to work. Currently I have my I3-6100 running at 4.1ghz using the stock cooler, settling around 68c during extended Fallout 4 plays. My inner IT guy will not let me push it farther without investing in a better CPU cooler so that is first on my list, probably something liquid cooled that can mount to one of the empty fan rails. I also gave the video card a bit of a OC as well. It was not needed for any of my current games but I was able to get my benchmark scores up. 1/24/2016 - I got my Corsair H60 installed. The notes for this will be added above in the parts list. As of right now I am running at 4.4ghz and keeping mid-50c for temps during extended play sessions. I did try to push it farther but ran into stability issues on the i3. 9/17/2017 - I mentioned this build was for future upgrading, and it is the future so here we go. Running an i5 7600K now. Looking at one of the new 10 series Nvidia as well but that will have to wait, probably until after the holidays. The build has been running rock solid. The case is a bit of a dust magnet but nothing too bad. This board is high on the price end but it was worth the expense in my mind. The MSI Live Update utilities seem to have some issues with the latest round of drivers and patches but so far everything outside of the .17 version of command center installed manually. It was a lot smaller than I was thinking but performs very well. A little powerhouse that pairs very well with my i3 Skylake. There is a firmware update that took care of some random fan spinning up issues I was seeing.. Overall this is a solid and well designed case. It lost a star for me with the PSU install as you have to get a bracket to latch on the hole in the drive cage, well out of sight. A long plastic tool will help to maneuver this while preventing the scratching. I put the window on the right side until I get some good measurements of the video card temperature. I do realize some of my selections may be a bit unbalanced. At the time of purchase my goal was future growth. Still I could have saved a bit of money here are there as you will notice. The only thing you could have really saved money on is the mobo, but if future growth is your goal, I don't disagree with any of your part choices. I'd love to see more internal pics though. I added a few in. I do want to see if there is a better way to tie down some of the cables so they are not so much in the airflow from the front case fan. Temps are fine so it is not a huge issue for me right now, just something to do for future cleanup. I am torn right now between a $50 mobo for the i3 and a $120 ish z170 for the same reasons. I also read that faster ram make a measurable difference as well as being able to overclock. But then I think well I can get the budget mobo and ram and the i5 6500 for the same price. Can't decide!! Your parts all look great to me. I have used that case before and really liked it. Wow, no bottleneck on the 960? I'm planning a build with the 960 and was wondering if it would.. my friend said I should go with a faster CPU but if it doesn't max it out, I don't see why not.. I still have my I3 at 4.4ghz and running strong. That being said, I am being very tempted to invest in the new i5 7600K, no need to hack the firmware and more cores. It will also give me room to expand to something in the new generation of cards...probably a 1060 based on current budget. Coming back I realize I misread you question. You can find my notes in the comment there, but basically I had to make sure to clear the firmware via the button on the back several times. Once it is working I took it slow, adjusting the BLCK, then memory speed to keep it below the memory speed so it would boot. I have not been as aggressive as I probably could be with the chip. As of this morning I am running the chip at 4.5ghz with the core voltage at 1.175v (Reported by CPU-Z, the Firmware setting is at 1.360v). Any faster and the PC does not boot so I may have hit the max on this chip. I have seen some posts out there where they got the chip up to 4.7ghz. I may wort on that when I have more time but for now I am happy with what I am able to get out of this I3. I loved the case, with the exception of the PSU install. It is just awkward to try and put in. I thing the case is ugly. can you put some more pics I may change my mind.